100-89, 100-90 and 99-91. Dufek lost a point for holding in the ninth. Akimov was down in the third, 60-53 twice, 59-54. 40-37 twice for Kazimov and 39-37 Dzakhurov. Huck retained the WBO title on two scores of 115-113 and an out of line 117-111. Arslan pressed the action and scored with an hurtful left upercut that had Huck´s nose bleeding. Huck was under pressure but got more into it in the last half of the fight. It was close but most seemed to think Arslan´s workrate had won him the fight. It was a tough, absorbing fight fought at a fast pace so full marks to both. Dirks won the vacant WBA I/C lightheavy title on scores of 117-107, 117-108 and 120-104. Conceicao was down in the second and had points deducted for holding in rounds four, seven and twelve. It was an ugly fight where Dirks loaded up too much and Conceicao, much smaller, spoiled his way through the action. Wilson hurt Gerber late in the first but was then outboxed in the remaining seven. 79-73 twice and 79-74. Kalambay was down in the first and last. 97-92 and 95-94 for Demyanenko and 96-93 for Frias. Frias was down in the seventh. 115-114 Nader and 114-14 twice. Nader boxed very well to begin with showing exellent handspeed but also an alarming lack of power. Santos patiently stalked his opponent, cut the ring off and at the end he had Nader under serious pressure. 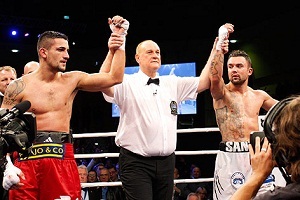 It still looked like he had left it too late but two judges felt otherwise and Santos can return home with the EU title. Weber was rattled in the fifth but outworked Rozvadovskij the rest of the way. Shala, a very inflated record, outpunched Baran most of the way of a sloppy fight. Rotolo retained the Italian middleweight title on scores of 100-90, 99-91 and 98-92. 78-74, 78-73 and 80-71. Bauwens had a point deducted in the last for losing his mouthpiece. 79-70 on all cards. Membreno had two points deducted and Nefzi one for various irregularities. Loy - first set to fight Levi Bowling Oct 27 in W Memphis, AR - stopped Murray with an overhand right, right upercut.